Ville Laaksonen (b.1978) is almost as fascinating as a painter as through hes CV and website, which give an clues of the figure of the artist and a painter. Laaksonen is clearly an artist of this time - still also going along with familiar ways. Laaksonen appears in is hes pleasant and earnest desire to declare as the classic angry young man. And he does this more enterprisingly and active as the cliché would require. He paints with enthusiasm, curates exhibitions and writes also critics. He writes about ancient deep things of faith, meditation and holiness. His colorising paintings provide clear references to Buddhism and esoterian studies - which does not prevent him from exhibiting at the World Trade Center's Business Gallery. Laaksonen presents a totally modern, new generation of artist character that intersects certain type of serious mental profoundness with a sense of self that needs to be presented in order to succeed. He writes the press releases of the exhibition himself - in the third person. Laaksonen is an emerging artist - breaking through. Until to his late twenties hes CV has developed slow and then, within three years: six solo exhibitions, some fourteen other and seven scholarships and grants. It might seem unfair criticism to puzzle young artist's career path and professional strategies, but in this case it seems to me that all of this has to do with what to think of the artist's works. This is, therefore in very positive sense, as Laaksonen would be quite easy to label hastily as a presentative of such self expressing ethernity color painters. But, personality conflicting cues, and the idea of ​​whether this is now presents something different, and makes viewing of these paintings in this case more focussed experience. Laaksonen has also received the Scholarship of Union of Finnish Artists Associations and as a result of this solo exhibition at the Art Museum of Varkaus. The reward also urges to take a closer look, and yes, Laaksonen is interesting. He paints large scale paintings, even so much so that smaller exhibition halls of the museum are at its peak with displaying the paintings. Laaksonen meets the canvas often with thick color-attacks and supplement this with color pressings and wipes. Result is rich in color, presenting the multilevel communication through the world of painting, particularly joyful and full with crude power of life, even though Laaksonen can also also handle the "compulsory Richterian sweeps". 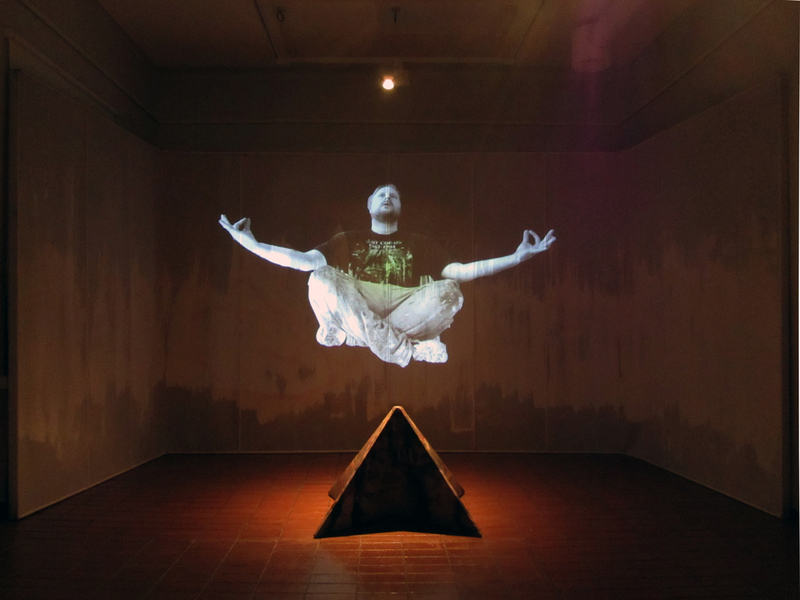 The entire exhibition and many of the titles of works and the back room on the lo-fi projection of Laaksonen floating meditation posture, refer to the deeper spiritual truths of searching, though not quite without irony, as such as titles like "Freud and Engels - Jung and Jang" shows. Laaksonen can be very serious in hes painting, from the very real, condensed and concentrated to the range just letting the pressure off: He lets everything come. And so here we are really in the culmination of modern goal-oriented, change of mind painting and one of procedural postmodern art. Even if some simplified or more figurative paintings are more energized and stunning, it seems best, however, that Laaksonens paintings keep one on the alert: adaptation of enthusiasm, longevity and astonishment makes the emotions vary - it makes these paintings - perhaps sometimes a little bit to be unfounded dispensed combination of the elements - nice to experience. Laaksonen quests for cross-influences of the styles, which leads sometimes to the funny situations that could have happened sometimes in the past. His painting-sculptures like Torso appear just like in the actual post-modern 80's. Psychedelia where he also refers to, and hippie paintings of Kleinbus are not really always far away either. 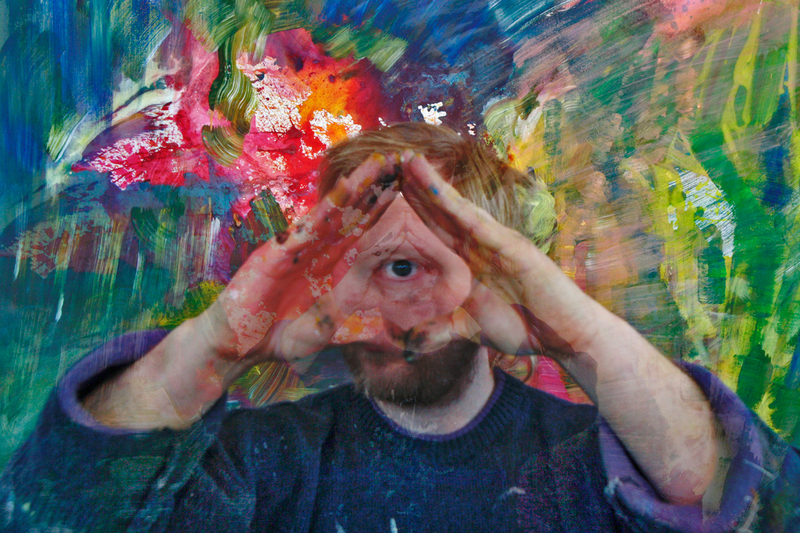 Could this success of Laaksonen present symptoms that the density of trends and frequency of styles is already so rapid that they don´t have to be reacted to anymore? One can and is allowed to do just what He self feels own. Turku-based artist Ville Laaksonen has earned his scholarship for a being the stipendiate of Union of Finnish Art Associations and exhibition in Varkaus Museum of Art. It almost feels bad on the artist's behalf. In front of Laaksonen's works there would be a opportunity to indulge in the art of painting, including one of the essential individual artist's virile dialogue with the universe. However, experience has been made as difficult as possible. The hanging of the paintings is completely classless and Art Museum appointed to the exhibition unsuitable for the purpose. In too small Museum form and content of the painting breaks to a confused mush. Paintings swallow strength from each other and at times seriality is lost in chaos. Laaksonen's paintings are, however, a model of a young man's search for truth and love. The power of his painting process, and the roughness of his work is clearly visible. This Laaksonen hardly wants to cover up. Painting seems to be a kind of battle for Laaksonen, or an dialogue with his partner, the ever-expanding universe. This private conversation hurls into the arms of the viewer and to the heart. He paints just like he wants to. This roughness of the exhibition is the most impressive part of exhibition. The artist has a unique, almost reckless way to build an image and create a whole that is chaotic and delicate at the same time. Among the works of the exhibition one is able to pick up pearls of painting. The brushstrokes are unrestrained, and even the dirtiness of colors in some places is appropriate. Laaksonen's brush bends to many and facing several large paintings one can choose to immerse in the details of the use of the brush. Some of the works are ready like an altarpiece, as one found in the large back room Sibelius Suite. In the same space there are indications that the artist's working methods and areas of interest for video and audio come implemented. The installation is generally site-specific, well thought out and built a whole. This installation is forcibly crammed it in an unsuitable condition, stored and left to be. The major topics and ideas, such as life, love, holiness, integrity and intuition, remain hanging in the air. When I notice that I wrote nothing in memory in the exhibition, I realize beeing pushed beyond analytical thinking. After the exhibition, this conclusion can be made also by another attention: walking out of the gallery, tears were streaming from my eyes. I've been pondering in recent times (notice how I avoid writing of Laaksonen's art) whether religious (or spiritual, holy - how you want to call it) from inside the human experience, or would require leaving the non-mongering. How far a man would get his mind in investigating on your own? Is the mind so constructed that the need for someone (a guru, prophet, priest) to tell stories, through which the mind opens to man for himself? Laaksonen_Goethe and GeistJotenkin this discussion seems to be present at Laaksonen works. The exhibition is a beautiful version of the traditional pyramid and the All-eye, a day of the week divine roots are exposed, at least in the name of the work on Thursday - Thor's day, and a Mary, apparitions, infidelity. In short, thousands of years-long search. Laaksonen's work looks so clean, that he has found something. Perhaps it was precisely the feeling that someone will find that it is possible to find, touched me most deeply. On the other hand the large paintings the colors and the fierce brush strokes (November värittömyyden soaking for the eyes) were so enjoyable to watch, that I go back to the show, as long as I could. I looked at paintings, and I regretted to lose for weeks, during which I have been sitting on your computer. How I was able to live without seeing the art? Some of the paintings were completely hahmottumatta me. I felt awkward in front of their anxiety. Do not want to move out. Most of the paintings in the exhibition is in fact such that the first does not understand them, but when the patience to look, the shape cues, presentiments, and figurines. And then, revelation, in front of a friendly picture. Such a way of seeing to expect that all works affecting the abstract can be found in the image that represents. And when some of the images may not be raised, then any, remains uncertain feeling. Is it there? Or should this painting to experience a different way, a complete abstract? Laaksonen_Sibelius suites, however: in particular, I liked the artist's courage to rely on the viewer. Joy of discovery is to be able to leave the recipient. Good after the show is forced to stop and think through all the ideas started to show. 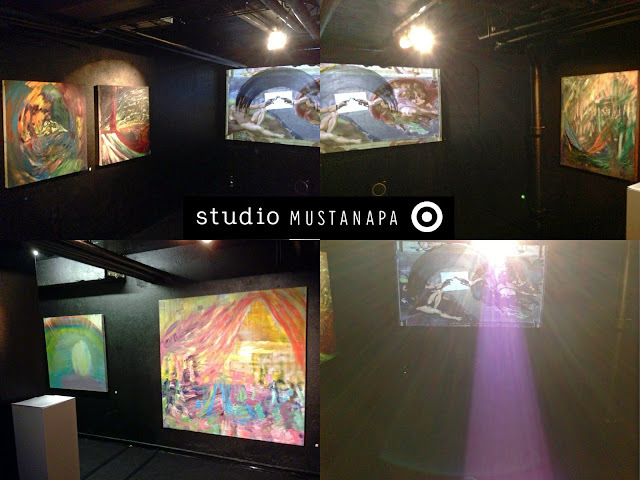 Paintings in the basement to watch directly interfered with the viewer's eyes directed at the lights. Okay, this is a bit out of place, but I could not watch them because I häikäistiin. I can not really remove any works in the exhibition package, but the journey is long and eyes up to heaven, I create vividly bring to mind the Vatican, where the walls and ceilings are gold, but while walking the halls of the sinking feeling of repressive water. The best art experience is such that scared, how much power in yourself to someone stranger has given to man (the artist). I can explain that this show was so powerful an experience as I have not had time to exhibitions of paintings for a while and just happened to deal with questions of interest to me, and so on. But I do not feel like one. Did I not say that the show took off his feet? I'm getting! This does not merit no further. Not that this can go as crazy. Jantso Jokelin wrote an article on Savon Sanomat about the exhibition. New exhibition by Sami Korkiakoski and Ville Laaksonen presents latest works under the HONEST PAINTERS-collective, which was founded in 2006 by these friends to state honesty as one of the main characteristics of their work. At that time collective had also third member. Honest Painters 2: Let the Picture come! at Gallery G12 speaks still forcefully for honesty. Art is characterized as a meditation towards the experience of truth. This leads to the question of nature of art. Is there lot of dishonesty in art? "We dont oppose anything or anyone. Idea is that we approach painting as a from ultimately subjective point of view towards honest way of painting." Laaksonen. Perhaps the idea is, that truth can be found in the process itself. This reminds me of known thought by Heidegger. Art allows us to see the truth in the existing reality. This is something these artist say they relate to. It is important let the world flow right, to let it be. Light feeted political declaration and opposing things dont last long in ideological sense. Gallery is filled with pieces of art, which can easily be described modern. Korkiakoski creates hes works on canvas and wood, creating unusual shapes for sculpture and painting. Sculptures are in a way just paintings for me, i dont take them too seriously, Korkiakoski describes. Huge and ambitious paintings by Laaksonen consist of distant figures from angels to people of the streets. Art world is filled with so much negativity now days. For us art is a positive thing, so we embrace beauty and joy. Sadly beauty is many times passed by other values when curating exhibitions. Despite artists say they dont oppose anything, they concider their work unconditional. Others shouldn't let effect the way of the work. Second part of "determinedly unnamed work". First part was "This is not Amerikkka". Video coming later. 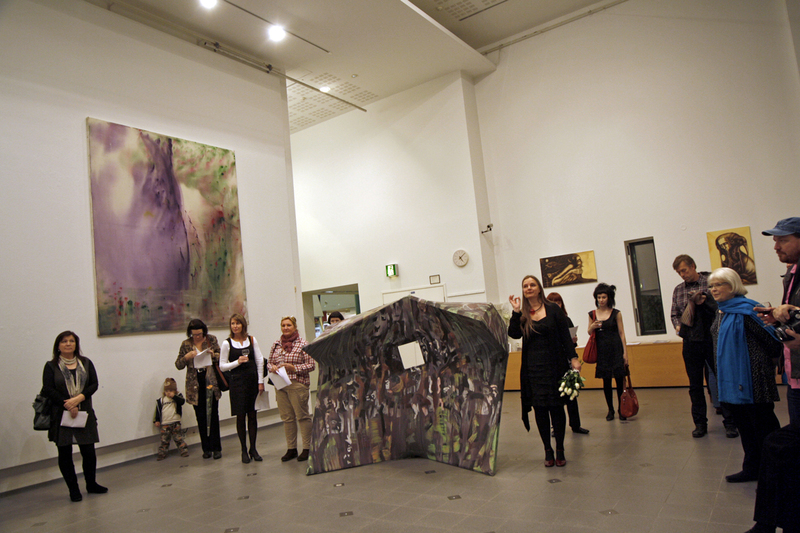 Billnäs young artists was a group exhibition and competition organized by Gallery Uusitalo and ArtShortCut. It was curated by Berndt Arell, Paula Holmila, Mårten Johansson and Ristomatti Ratia. Jury was led by owner of Billnäs Olli Muurainen. 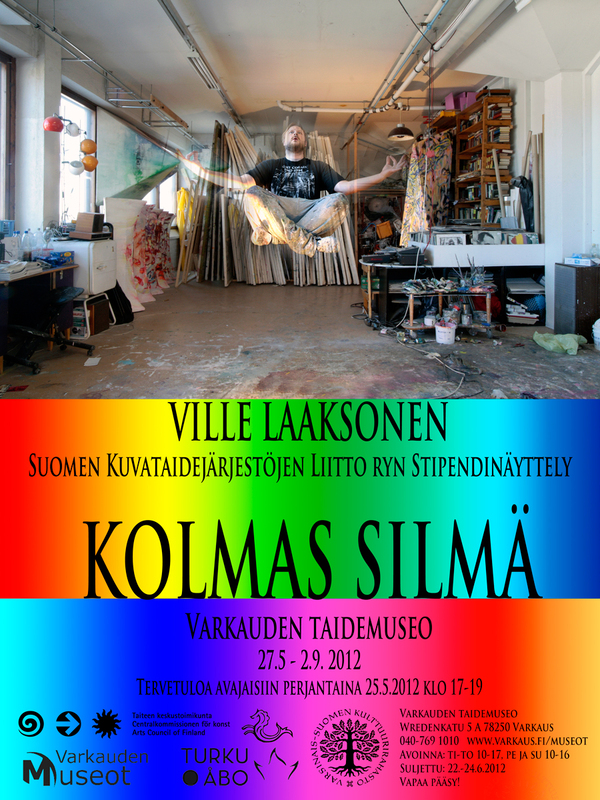 Pauliina Laitinen-Laiho invited me to exhibit my works at S-Galleriaikkuna. I collected a showcase of works from the exhibition series "Faith, Hope, Love", which I titled "Matter of Faith / Uskon kysymys". Otso Kantokorpi, curator and critic reviewed it with hard words on his blog "Alaston kriitikko". Love exhibition at Galleria Maaret Finnberg went good. Turun Sanomat wrote a big article and Wäinö Aaltonen museum bought two works to their collection. 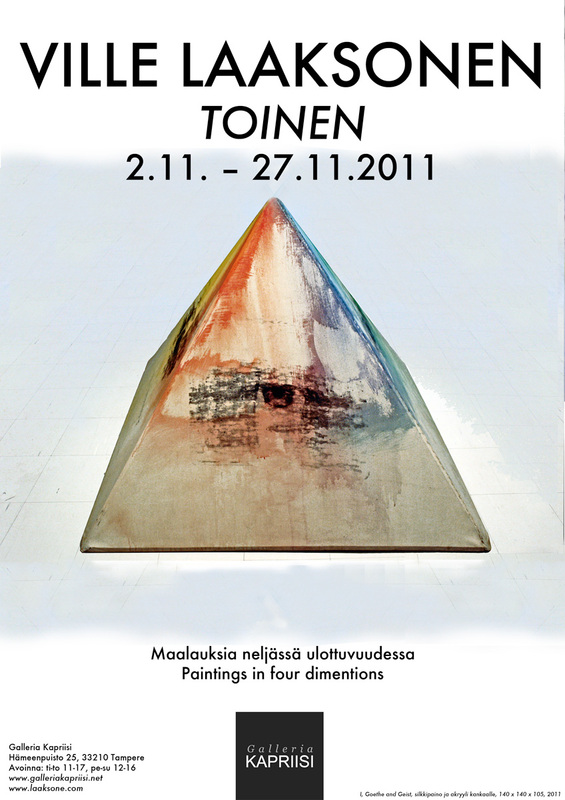 Pyhä Tuho / Holy Doom exhibition had also some of my works on it. Idea of having my own works on the exhibition was written to concept of the exhibition: all the curating artist had their own works along side with the artists curated. This opens up the background of their curatorial selection. Curators wrote on their background to exhibition catalog. Below a picture of my works on the exhibition and a picture of the painting Asgård, (oil and acrylics on canvas, 300x250, 2010). 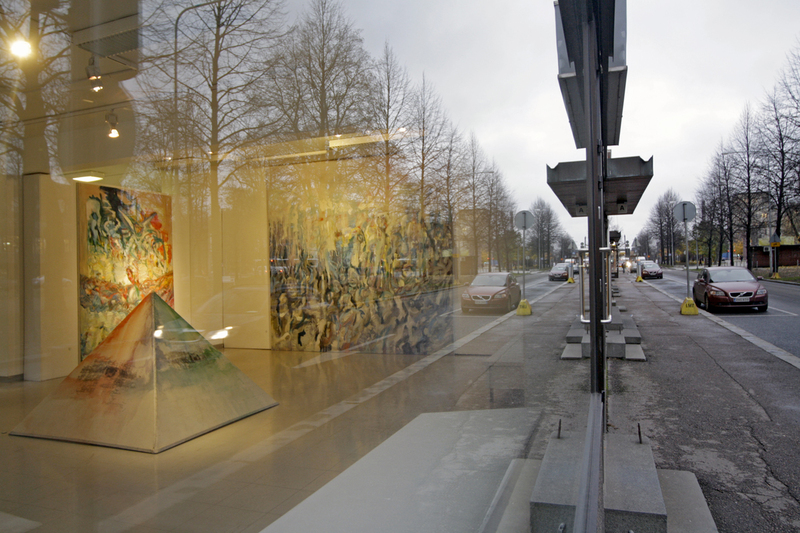 Work was acquired by the collections of Åbo Akademi University to be placed on university's building in Vaasa. General view and a picture of the title work "Hope" (Oil on Canvas, 450 x 280, 2010) from my solo show, Hope (fin. Toivo). Gallery Poriginal, Pori. Poriginal gallery hits the with its Easter time exhibition. Downstairs of the gallery is taken bombastically by Turku based Artist Ville Laaksonen. Upstairs dedicates its space to the fantasy world of Mika Rättö. Limits of the space are put to test both in scale and amount of artworks. Paintings by Ville Laaksonen bombard the circus of colors like fireworks straight into the mind of the viewer. Fiercely battling deep in the jungle of colors, Laaksonen manages at the same time creating a harmonic set of color and a balance between the abstract and figurative painting. Pictorial world is present only if viewer feels it necessary. Referring to the historical world, rose windows of the churches and masterpieces of the latter days are touchingly present, while at the same time not bothering the experience. Radiant mosaics of colors touch with expression. At the top paintings give a grandiloquent, optismistic sight on the world. Laaksonen´s vast works - they are full of extreme glory or grande circus - depending on the viewer. Here we have a maximalist and a impressive set of works! "After seeing the invitation to Ville Laaksonen exhibition "Faith" (finnish; Usko= also believe) I expected to something much darker that those paintings filling up Saskia gallery. In front of art expectations and prejudices are meaningless, though hard to get over - critic is also a human. This critic happened to see the movie "Dogma" (1999) evening before the viewing the exhibition. Movie keeps on going in Laaksonen´s exhibition, though movie and the paintings don't have anything to do with each other. Well, maybe there is something. 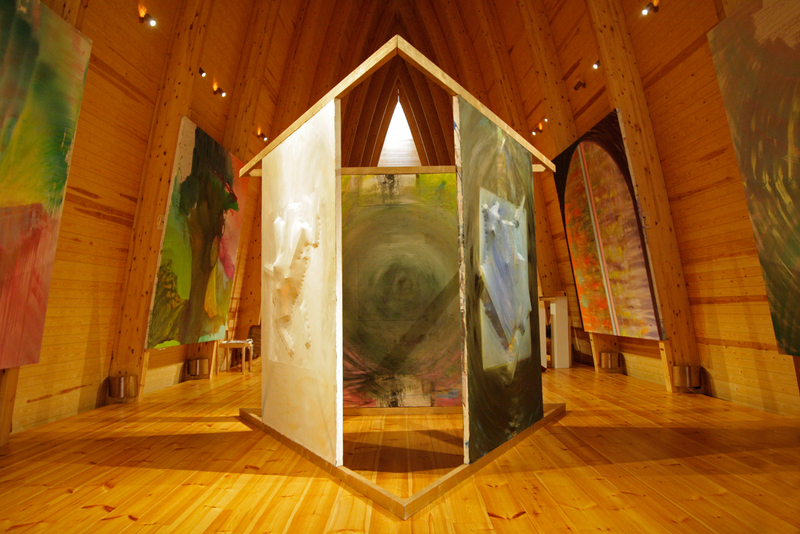 "Faith" is a exhibition about faith, but not in a religious sense. 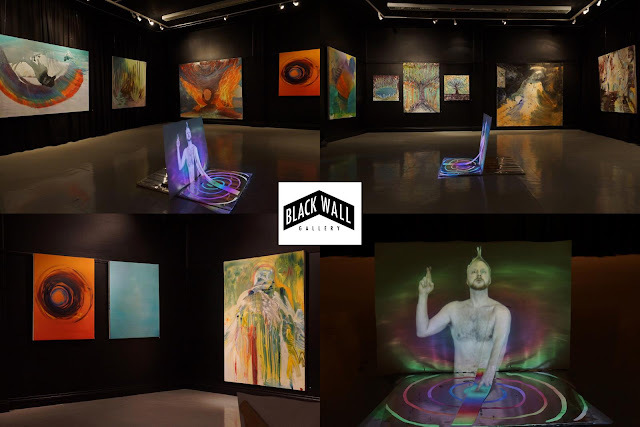 It is an exhibition about the leap of faith, about the meaning of believe as a entity, which makes everything (faith, art or even the movement) possible. Great deal of our lives is based on believe, and maybe it has to be, so we can wake up every morning not thinking about if the sun is going to rise next morning. Best sentence i can think of, describing Laaksonen´s work is: "It is there, it is´nt there". Paintings are flashes and movement (how to tell about the movement on a painted surface? dots of paint, sliding like clouds in front of your face just to disappear? And about the light, glimmering behind averything off the surfaces of the skyscrapers?) Paintings have layers. Suddenly you see something emerging (a face!) and then something else too (another face! a wing! graffiti on the wall! ), then everything vanishes, and you are left with a two dimentional, flat surface, that doesnt let you in. - There is a lot of works, and there is so much in everyone of those. As a pedant viewer i would´nt like to pass on any of the works, but i find my-self exhausted before the end of it. I wish there was more of those small, and easily opening paintings (ones like "Tie" (eng - road) or "Odotus" (eng. Wait), suprising with luminosity like a bling opening of the curtain) between the great paintings. - Part of the works are so big, that one can not get far enough from them. This of course is nobodys fault (very few galleries have enough space for this). Sometimes the feeling is so intense, i feel like watching the movies too close. Distracting, blinding movement, you barely are able to comprehend. Exhibition is a intense experience. Artist not only sticks to he´s subject but also brings amazingly history as a part of our life. He seems to see, how we are the same, regardless of time, yet so different. We cannot imagine, what the builders of the pyramids have thought. Even pharaohs ruled from cities, having the similar experiences as we have nowadays, still we couldn't understand them, if we had the possibility to meet them. Cultural differences, completely different hegemony of thinking would prevent us from finding the words. So we would talk of different meanings. All this is in Laaksonen´s works, similarity and the violent difference, that can not be connected. Part of the paintings are three dimensional. Going around them gives you a reward, clearer representation compared to the two dimensional works. Its curious, that one of the three dimensional works, the staircase shaped title work of the exhibition, "Faith", is despite of it´s shape one of the most traditional paintings. Blue staircase has wings, steps in the snow or on water, easiness. Red part has fire and spilling blood on it. World is divided in two, good and evil or - in other way thought - calm and the chaotic"
"More would have been less"
Ville Laaksonen´s great, fiercely colorist paintings don't seem to have enough space in gallery Saskia. You would have to see these paintings from a greater distance in order to see their chiaroscuro, motion and lightspots. Laaksonen paints on enormous canvas´s with giant brushes, expressing rapidly ideas. As a speciality, some of the works are three dimensional. Laaksonen talks with history of art, especially in hes sculpture "Ideal" (fin. Ideaali), which borrows its idea from Michelangelo sculpture, "Dying slave" (1513-16). Exhibition would have clearly been better with less works on it: it takes great deal of good will and faith to get something out of this horn of plenty. Articles about the exhibition were also on Aviisi newspaper (after H.R. Giger) and in Tammerfors Aktuellt (12.2.2010). Turun Sanomat critics(by Hanna Lamnaouer). 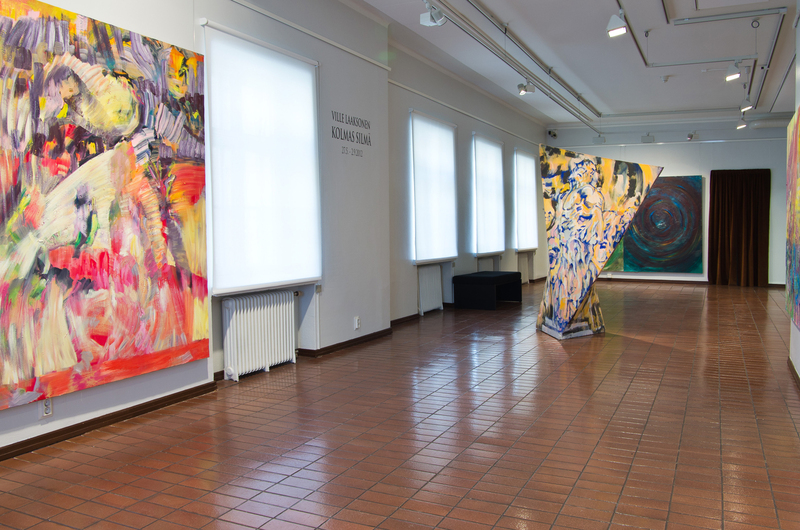 "Vibrantly attractive and patiently celebrating paintings"
Graduation work from The Aalto University School of Art and Design by Ville Laaksonen is titled "Time" and is presented In Gallery Nefret. Themes of the exhibition are patience, flashing memories, light and color. 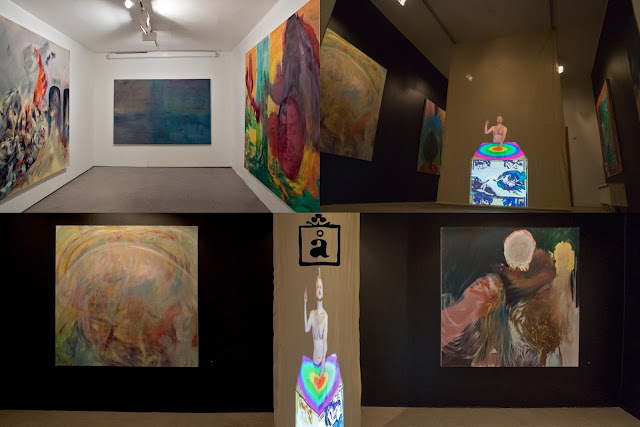 Vast gallery space fits splendidly to these coloristic paintings, which underline the physical definition of lights radiation energy. Mostly abstract works have hidden faces and parts of writings on them. This is done in a way which continues seamlessly form and language of the painting without challenging the general view on paintings. Joy of work and professional commitment is strongly present. Diagonal lines and composition that disappears on edges forms a construction charged full with vibrant attraction and expressive energy. In many cases compositions draw their attention to the center of the image, where dots of color become more intense and darken. Natural intention of color to rise out of the surface is seized by the fragmented generation of patterns, helping the shape to stay at the two dimensional impression. Hard center is surrounded by smoother and therefore space creating repeating forms. Together with these more intense areas create an optical effect where it seems the surface is curving strongly out of the picture. This can be noticed especially in the pressing center of the painting titled "Halo". This Is Not AmeriKKKa was a painting performance which left a permanent work to Patarei culture park in Tallinn, Estonia. This was done by using a video projection by a media artist Turu Sanom (Artturi Elovirta) as a basis of the painting. Projection was based on the abstraction of the movement of the audience by video cameras and motion detectors. 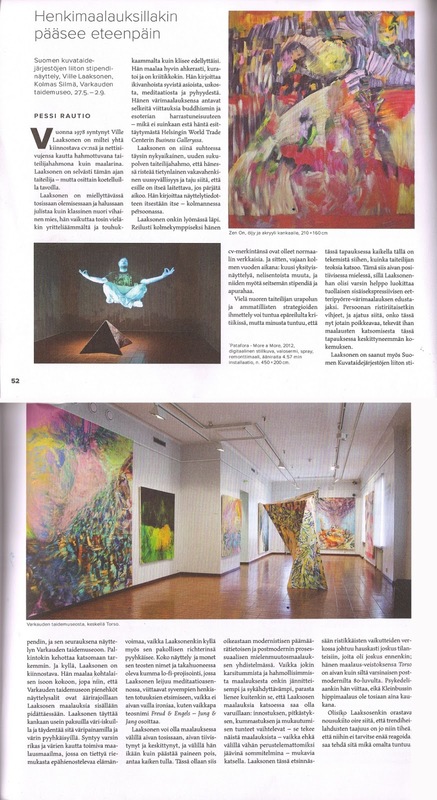 Article on Eesti Paevaleht about my action painting performance on videoprojection, summer 2007, Patarei, Tallinn. Group exhibition with Sami Korkiakoski and Pekka Kuusela was a statement on honesty of painting reflecting the idea of the "stuckism" art movement. We got horrible critics by Hanna-Riikka Kuisma for this one. I felt like she had missed the point totally. Fortunaltely my part wasn't the worst of it. 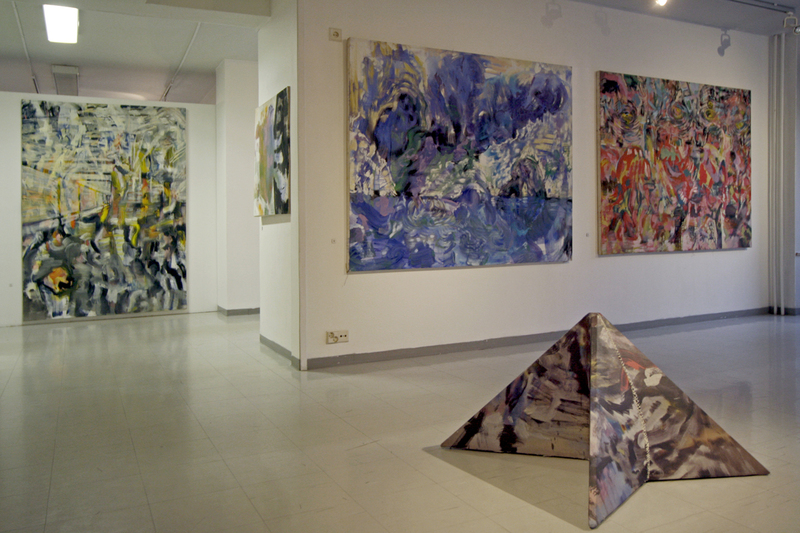 Works of the current exhibition at Poriginal gallery remind me of the celebrated "young artists of the year" 1999 and their exhibition in Tampere art museum. There is certain similarities; three men of thirties making expressionistic paintings flavored with pop culture. Of course in a more modest way. Knowing the history of art one can not avoid from noticing certain influences. I doubt for example Jean-Michel Basquiat, who died in the 1980´s, is an idol of all three painters. In addition paintings remind me of Dubuffet and De Kooning, especially in Ville Laaksonen´s brutish human figures. He´s social statements remind me also from some of Teemu Mäki´s works. Especially tempting is the triptych called "Media", which combines in a pressing way elements of war, television and a figure of a woman, three keystones of mass media. Also another entity "From Hitler to Albert Einstein" consists of images of western culture, with a heavy pressure. Article of my early exhibition "Googles" in Turun sanomat. Turun Sanomat article about "Ei Pattereita -duon, "Retrospektiivi" (NO BATTERIES - RETROSPEKTIVE) - exhibition together with media artist Artturi Elovirta. Mixed media paintings on digital prints, 2005.